The Brazil nut tree is a local giant in the Amazon Rainforest, reaching heights of 40-50 meters (130-160 feet) and 1-2 meters (3-6 feet) in diameter. What is even more extraordinary is this tree can live to be 800 years old! The fruit of this tree is a large, round woody capsule, about the size of a grapefruit. The fruit capsule grows at the end of the thick branches and weighs up to 2.2kg (5 lbs), when ripe the fruit falls from the high branches like a cannonball and comes crashing to the rainforest floor. Fortunately for our i2P team the fruit ripens and falls from January to June so hopefully they will not have to dodge too many falling Brazil nut capsules! Within the fruit capsule you find 12- 25 Brazil nuts arranged like orange slices. Each nut is encased in its own shell that has to be removed to expose the fleshy seed, this is what we are accustomed to buying in the store. 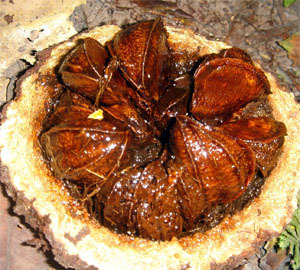 A mature Brazil nut tree can produce as many as 300 of these capsules each year. This is one of the largest exports from the Amazon, alone the United States imports more than 9 tons of Brazil nuts annually! It takes the average tree 10-30 years to reach maturity and produce fruit, so it is critical that people harvesting the seeds ensure that enough of the seeds reach the forest floor to grow new trees for future generations. It is also important to note that practically all of the Brazil nut production comes from the wild forest trees and not from plantations. This is one of the few economically important plants that are exclusively harvested in their natural rainforest habitat. It took scientists hundreds of years to try to figure out why these trees would not produce fruit in plantations or areas of the forest that had been clear-cut. It turns out that Brazil nut flowers require a certain species of bee for pollination. The bees in turn require a certain species of orchid to survive. Male bees must acquire the fragrance of this particular orchid in order to attract female bees. If the forest is damaged by clear-cutting, the orchids disappear, along with the bees and the Brazil nuts. Another major team player in this delicate ecosystem is the agouti, which is a large rat that is the only animal capable of chewing through the tough fruit capsule and dispersing the seeds for new tree growth. If the Amazon rainforest loses the agouti, the bee, or the orchard we will no longer have Brazil nut trees! This is just a small example of the intricate ecosystem of the Amazon and many other places around the world. The Brazil nut tree seed, which is known to us as the Brazil nut, is jammed pack with nutrients. It is a moderate source of protein and carbohydrates, but a rich source of good fats. Furthermore, one Brazil nut exceeds the recommended daily allowance for selenium and contains other vitamin and minerals such as thiamine, vitamin E, calcium, magnesium, phosphorus, copper, maganese, and many bioactive food components that act as antioxidants. For many of the rural and tribal people of Brazil the Brazil nut is a staple to the diet providing a valuable source of calories, protein, and fat. The nuts are eaten raw or grated with the thorny stilt roots of the Socratea palm into a white mush known as liete de castanha and then stirred into manioc flour. Furthermore, the local people use the rich oil for cooking, soap, conditioner for hair and skin, and lighting lamps. The seed pods are used to collect fresh drinking water and to make smoky fires to keep insects away. Brazilian folk medicine used the husk of the seed pods to brew a tea to treat stomachaches and the tree bark to treat liver ailments. Next time you are in the grocery store look for Brazil nuts and maybe sample a couple. This is a taste of the Amazon rainforest! On the following page there is a yummy recipe you can try at home as well!